US magazine Sight Unseen has partnered five New York and five Norwegian design studios to create products for its annual Offsite exhibition, with results including brick furniture, a bent-steel bench and colourful glass vases. Now in its second edition, Norway x New York aims to showcase the similarities between New York and Norwegian designers, who are relying less on brands and more on in-house production. "Both countries have far more skilled young talents than they do manufacturers, and like American designers — who have shifted, in the past 10 years, away from a reliance on brands and more toward self-initiated production and distribution — Norwegian designers are also beginning to embrace their independence," said Sight Unseen founders Monica Khemserov and Jill Singer. Over six months, the pairs worked long distance to create a pieces of furniture, lighting and accessories. Each one uses a different type of American workshop and can also be manufactured for future sales. Sight Unseen Offsite takes place 19-22 May 2017 at 100 Avenue of the Americas, New York, as part of this year's NYCxDesign festival. New York studio Vonnegut/Kraft and Norwegian studio Kneip took cues from construction materials to make this collection of tables and containers. Made of grainy light and dark bricks, the products all feature rounded edges a reference to the natural weathering of the material. One of the tables features a light brick base that curves inwards and underneath a wooden, basin-shaped top, carved by a Brooklyn woodworker. Vessels vary in shape from one with a squat base and a slender neck, to a taller cylindrical version. The insides of these glass vases are coloured in blends of blue, red, orange and green. From different angles, the colours appear to blend with the top. Moving Mountains and Runa Klock collaborated with glassblower Andrew O Hughes from Brooklyn studio and incubator UrbanGlass to learn about the historical glass making process for the project. 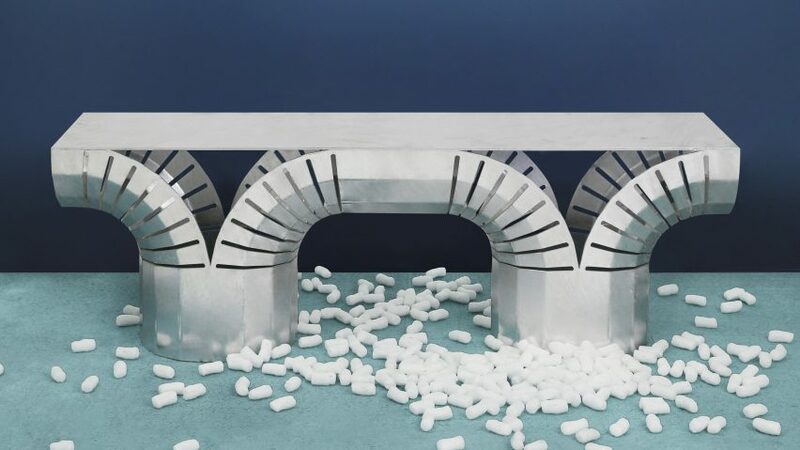 Jamie Wolfond's mathematical design method met with Sigve Knuton's instinctive approach to create the Split Bench, created by bending a flat sheet of metal. The base is shaped into two columns that split in half and curve in opposite directions, while the sides are marked with thin perforations. Wolfond – who was born in Toronto but now lives in New York – and recent Design Academy Eindhoven graduate Knutson galvanised the metal to finish. The zinc coating protects steel from rust and breaks up the geometric shape with a shimmery texture. A 1940s Swiss knee-rest for praying was the main influence for the BUE stool, created by product designers Noidoi and industrial design studio Visibility to aid mindful living. I-shaped ends of the American oak base are bridged by a single block in the middle. The wooden bars at the top are cut with narrow slits, creating gaps for a seat made from Norwegian wool to slip into. Light is reflected off a pivoting brass disc in this unconventional lamp by Oslo-based industrial designer Thomas Jenkins and Brooklyn-based Slash Objects. The duo chose a simple pair of subdued materials, pairing the metal elements cut by a Brooklyn metalsmith with a concrete cylinder base cast in Slash Object's studio. Photography is by The White Arrow.